The thing I love most about summer is that my kids get to have those long unstructured blocks of playtime that they need and crave. However, I know I will hear, “There’s nothing to do…” more than once! In the interest of being proactive, I’m putting together some summer fun bags – ziploc bags filled with simple, open-ended projects and ideas that will hopefully spark the girls’ interest and get them busy doing something. My girls love puzzles, so I think they will enjoy playing with tangrams. I printed the tangram template here on colored cardstock. I used the large template, which still fits on a regular size sheet of paper. 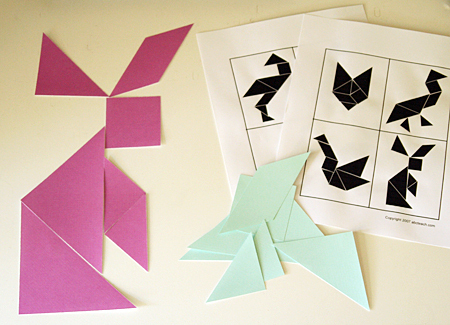 I cut out two sets of tangrams, and printed the animal tangram puzzles from abcteach. I’m sure the girls will also enjoy coming up with their own designs! More Summer Fun Bags to come! Happy playing! You seriously have some of the greatest ideas for kids. It always makes me want to come be a kid in your house!! Thanks for sharing!! Actually, my kids (3 and 4) don’t like tangrams. I got them some where you have a big card with a pattern and then you lay the blocks on top. They get frustrated because they can’t get it perfect. I just put them away and decided to try again in a year or two. I was really surprised because my 3 year old loves puzzles. He can work 100 piece jigsaw puzzles. Maybe when he’s older. Or maybe it’s just not his thing. I LOVED tangrams when I was young. Great idea! I’ve been wanting to introduce tangrams to O. Thanks for the links! Tangrams are sooo much fun for all ages. It was a very popular center when I taught (retired now but love doing all these wonderful things with my grand children). Plastic tangram pieces are available in teacher stores…some clear that work great on glow boxes; others solid. I love your website!!!! You have so many clever inexpensive ideas. We are ALL having a ball putting them into practice. Thanks for sharing and educating the generations moving forward.